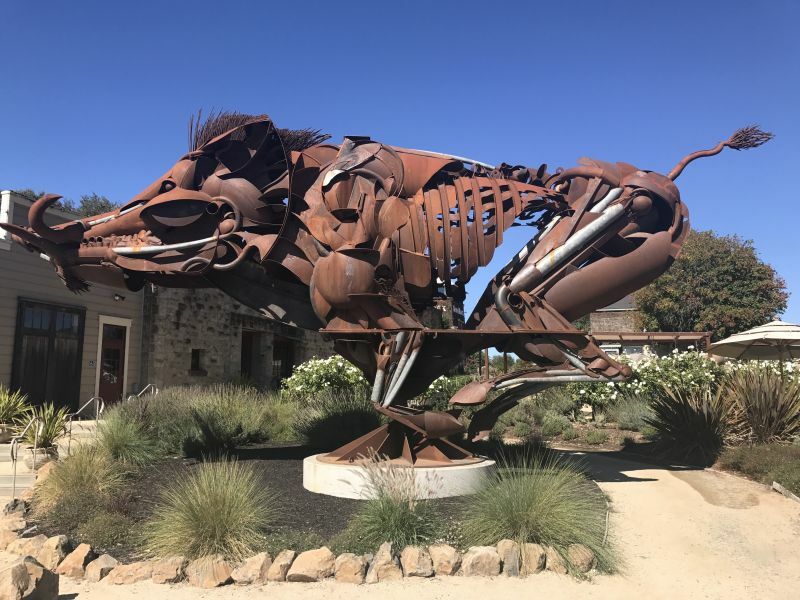 We were driving through the rolling hills of Sonoma County to lunch in Geyserville when we saw a massive iron sculpture of what looked like a wild boar. Intrigued, we pulled over and into the parking lot of the Soda Rock Winery. We stopped for the pig, we stayed for the wine. 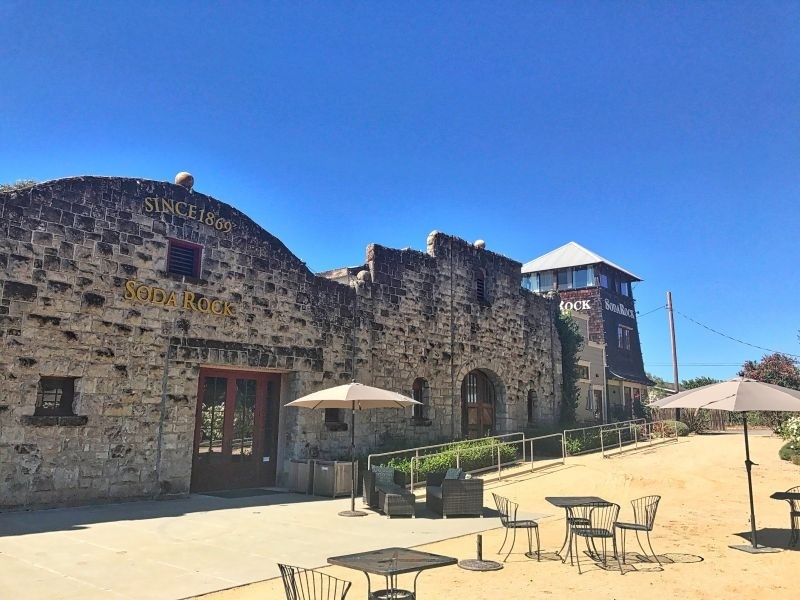 The site consisted of a series of nineteenth-century buildings, one of which had been converted into a tasting room for Soda Rock. In front of the tasting room were assorted tables and chairs for those wishing to enjoy the sunshine on what was an unusually warm day for late September. The buildings were originally the post office and general store for Alexander Valley. A winery had existed on the site as early as 1880 but had ceased operation by 1908. The current business was started in the mid-2000s by Ken and Diane Wilson; who was also responsible for the restoration of the buildings, which had fallen into disrepair. Our tasting started with the 2016 Alexander Valley Sauvignon Blanc ($24). The wine was a pale straw colour. The nose offered familiar notes of mown grass and lemon, set against a rich floral backdrop. The acidity was high but in balance with a delightfully complex set of fruit flavours: peach, grapefruit, and green apple. The wine is fermented in 100% stainless steel. After the Sauvignon Blanc, we moved to red and the 2013 Alexander Valley Cabernet Sauvignon ($45). The wine is 88% Cab and 12% Syrah, with grapes selected from all across the Alexander Valley AVA. Swirling the garnet-hued wine revealed a medium intensity nose of plum and leather. Moderate tannins were present in a balanced, ready to drink now wine that offered flavours of plum, mesquite, and pepper. The 2013 Twisted Rail Cabernet Sauvignon ($48) draws its name from the railroad that used to run through the area taking people to the local spas. The wine is made from hillside fruit grown in vineyards close to the Russian River AVA. The cooler climate results in a long hangtime, with harvest sometimes as late as mid-October. The medium intensity nose was full of fruit. Taking a sip I found soft, yet assertive tannins that danced in the mouth. The flavours were a delightful mix of cherry, nut, and coffee. The wine contains 5% Merlot to soften the Cab; the result is excellent, approachable, and eminently sippable. The wine has won multiple awards, including a gold medal at the 2017 San Francisco Chronicle Wine Competition. None of the wines made by Soda Rock are large production. Most are produced in quantities of between 120 and 300 cases, with 400 cases as the maximum. Our third red was the 2013 Spur Hill Cabernet Sauvignon. The wine sells for $45, with fruit for this 100% Cabernet grown in the North of the AVA. I was met with an intense bouquet of raspberry and redcurrant. The wine had moderate to high tannins, with rich flavours of plum and leather. In contrast to the previous two wines, which were drinkable immediately, this one is age-worthy and needs time in the cellar before it can be fully appreciated. Our fifth taste was the 2014 Lord Snort. The wine is named for the sculpture that had drawn us to the winery. The sculpture is the work of Brian Tedrick, a Sonoma artist. It was created for the 2016 Burning Man Festival before being displayed at Soda Rock. Below is a video of it in action. The wine was a blend; 60% Cabernet Sauvignon and 40% Merlot, which sells for $32 a bottle. The intense nose of raspberry and plum was one in which to revel. I love a wine whose bouquet is so appealing that you are reluctant to pull it away from your nose and taste. In this case, the flavours did not disappoint. A silky smooth mouthfeel with rich notes of plum. The most approachable of the Cabernet-based reds we tried. Our tasting wrapped up with 2015 Wedding Cake Zinfandel ($38). The name draws parallels between the layers of a wedding cake and the layers of flavour in this Zin made from Alexander Valley fruit. The nose was a medium intensity mix of plum and blueberry. Taking a sip, it was clear that this was not a Napa or Lodi Zin; the cooler climate resulting in a wine that was not jammy, but with a more subtle, almost sneaky sweetness. Medium acidity created a delightful tension with the notes of fruit. This was our favourite wine of the tasting and along with Lord Snort, we purchased a bottle. The iron and steel of Lord Snort may not be subtle, but it did the job of catching our attention. I am glad that we had time on our schedule to stop at a winery we were passing. 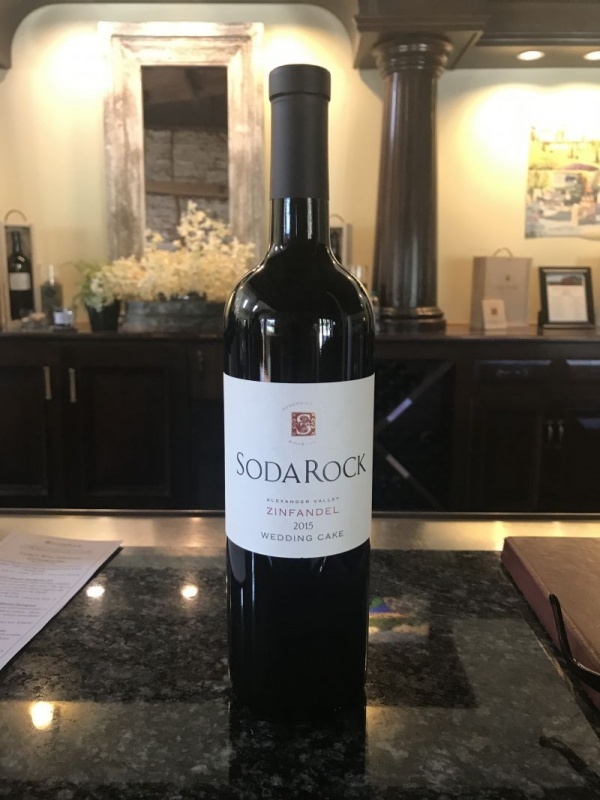 Our visit may have been pure serendipity, but if you are in Alexander Valley or in the Healdsburg area then Soda Rock is worth making plans to visit. Another great post guys. We’ve added this to our list of places we have to visit.